During my graduation days, I got a chance to enter into a dreamland of dosas. My PG auntie was from Kundapur & she used to prepare different varieties of dosas. Some of them being, cabbage dosa, drumstick flower dosa, tomato dosa & what not?? She used to mainly serve these dosas as a sidedish, rather than for breakfast. After marriage, it was another fantasy world of dosas.., jackfruit dosa, raw banana dosa, cucumbar dosa, matti gulla dosa(brinjal dosa), heerekayi dosa & many many more. Over all these years, I tasted varieties of dosas & also learnt handful of them. I had tasted this heerekayi dosa only once during my visit to my in-law's native. It was awesome & during my in-law's stay recently, I requested her to prepare the dosa for me. Because, other dishes took higher priorities, this dosa was queued up & one the last day of her stay here, she gave me the recipe & asked me to prepare it myself .., THUD....(sob sob.., I knew the recipe, I wanted to relish what she prepared). Anyways, you must be thinking, how much I blabber for a simple heerekayi dosa.., what to do, I dont have anybody to listen here.., hence.., puking out everything in my space. Wash the rice & beaten rice thoroughly & Soak it for 3-4 hours. 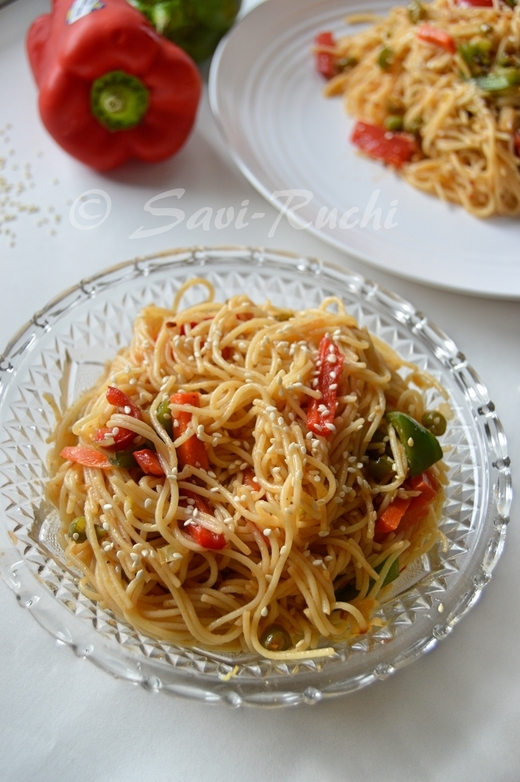 Prepare a smooth batter of rice, beaten rice, red chillies, tamarind powder, curry leaves. 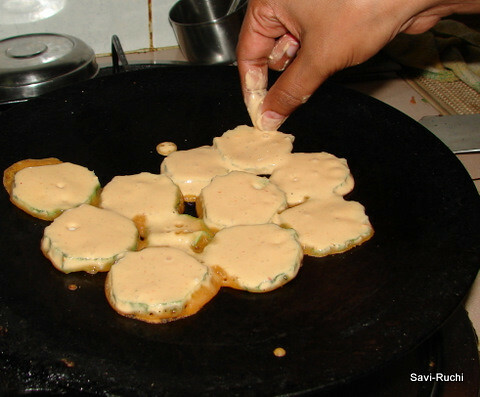 Batter should be like bonda/bajji or pakora batter (batter is little thicker than normal dosa batter). Add salt, asafoetida & sugar to the batter. Mix well. Meantime, place the ridgegourd slices in water. Heat the dosa griddle, drizzle few drops of oil to it. 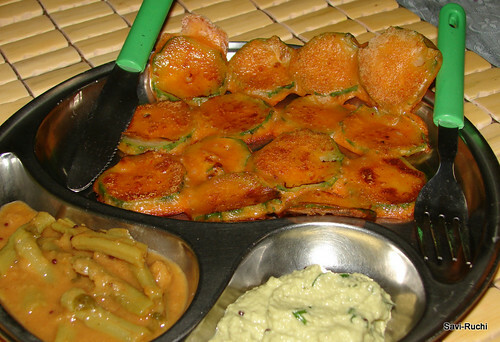 Dip ridgegourd in the batter & arrange them on the tava/griddle(refer to picture below). The ridgegourd slices must touch each other. Add 1/2 tsp oil, cover the griddle with a lid & cook on low-medium heat for 1-1.5mins. Turn the dosa & cook on the other side too for a min. Serve it hot with ghee as a breakfast or a sidedish to rice. Instead of raw rice, I used Thai rice. Hence, I increased the beaten rice to 1/3rd cup for 3 cups of thai rice. So, it is important to adjust the beaten rice accordingly to get soft dosas. Else, the dosa becomes very hard & rubbery. Addition of coconut (around 1 tbsp) will also enhance the flavor & softness of the dosa, however I try to avoid as we normally consume a lot of coconut otherwise. If some more batter is left over, add some water & make it pouring consistency. Prepare thin crepes/dosas with it. (We call it uppu-huli-khara dose. Uppu-Salt, Huli- Sour, Khara-Heat/Spice dosa). These thin crepes/dosa are also equally tasty. 1. Goes to Sia & Lakshmi for "Udupi-Mangalorean Cuisine", as it an authentic South/North Canara dish. 2. Padma for her event "Dosa Corner". Such a lovely dosa variety Sushma... looks so tempting and nice recipe. Thanks for sending it to my dosa event. Kundapur is one lovely place, have been there a couple of times. Idanna node irlilla to. Thanks for introducing me to new type of dosa. Got to know recently that something like this really exists...and now I am seeing that in ur blog...sometimes even I crib about my favorites like you dear..anyways lovely dosa..
We call this heerekai chatti!! Jay can live on this 24/7!!! You can use balekai to make this or add finely chopped soppu and like thattu like rotti! Soppina chatti, eerulisoppu is the best! Thats a variety Dosa or sure..looks awesome.. Hearing it for the first time.. great entry for a grand event..
Hi Sushma..My mom also prepares this.I make with sweet potato and also cabbage.Good entry. nice recipe. First time seeing such a dosa. It looks like alot of bhajjiyas put together. Wow, never heard of it. So simple to make! That's a new dish to me. Nice one. Hi Sushma.. I am new here. Your entries make me nostalgic of mom's food. My mom too made this and I loved eating them with honey and butter spread on dosa..
new kind of dosa, looks very yummy.., my first time here, you have a lovely blog, i have an award to pass it on to you in my blog, do collect your award please.., if you already received it, my congrats to you. your photos are very good, and step by step creation is good too..
hey, never tried dosa in this way, looks so gud and nice !! great entry !! my mom adds grated veggy into the batter to make dosa !! Hi there. New to your blog. Hopped over from Nags blog. I'm a kannadiga in S'pore too ! Echoing words of may commenters, this dosa is new to me as well. Try maadi noduthini. Thanks for sharing. Hi Sushma! Absolutely south canara flvor oozing out of the dose! Great blog! wonderful recipe. Can you please post recipe of matti gulla dosa(brinjal dosa)?